A combination module of two essential building blocks from the classic Polivoks synthesizer: the envelope generator and a high-quality audio VCA. The envelope features the four traditional ADSR parameters, as well as additional controls for manual trigger, extended time range, envelope repeat, and a delay function for the attack and release phases. The VCA has several attenuated modulation inputs and a manual "drone" level control. The output of the envelope is normalled to the VCA control input, for compact and convenient integration into the end of a subtractive synthesizer patch with a minimum amount of patch cables required. Note that the original Polivoks keyboard design includes two VCAs in series for independent control of the keyboard envelope and amplitude modulation. You would need two of these modules to completely recreate the functional specification of the original. This device is part of the IRON CURTAIN ELECTRONICS system and is created in collaboration with Vladimir Kuzmin, the designer of the original POLIVOKS synthesizer. 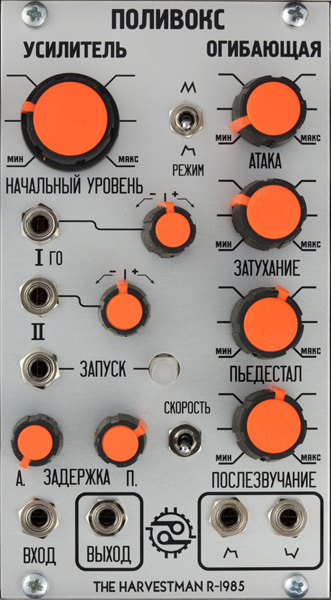 The module uses original USSR integrated circuits in the differential amplifier section of the VCA circuit to preserve the character of the Polivoks design.